This map covers the distribution for all Asian Elephants. The Bornean population is marked ‘origin uncertain’ for reasons explained below. The Bornean Elephant is a subspecies of the Asian Elephant, physically and behaviourally different from the elephants of mainland Asia. Known locally and commonly as ‘Bornean Pygmy Elephants’, they are about a fifth smaller than mainland Indian Elephants but similar in size to populations of Sumatra and the Malaysian Peninsula. They are generally more rotund in appearance with shorter trunks and a smaller rounder face, which makes their ears appear larger. They also have a long tail, which in some individuals reaches all the way down to the ground. Only some males display tusks, which are shorter and straighter than in the mainland elephants. 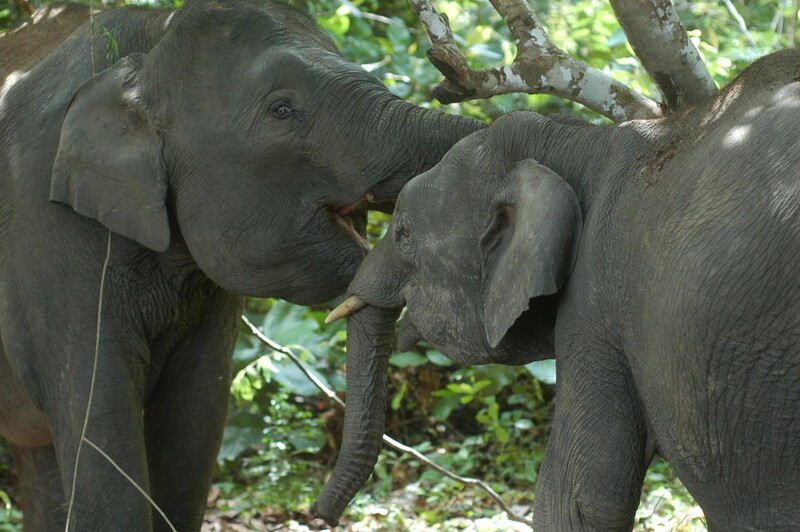 The behaviour of the Bornean Elephant is said to be much gentler and less aggressive than the mainland Asian Elephants, supporting the idea that they may be descended from a domesticated population. 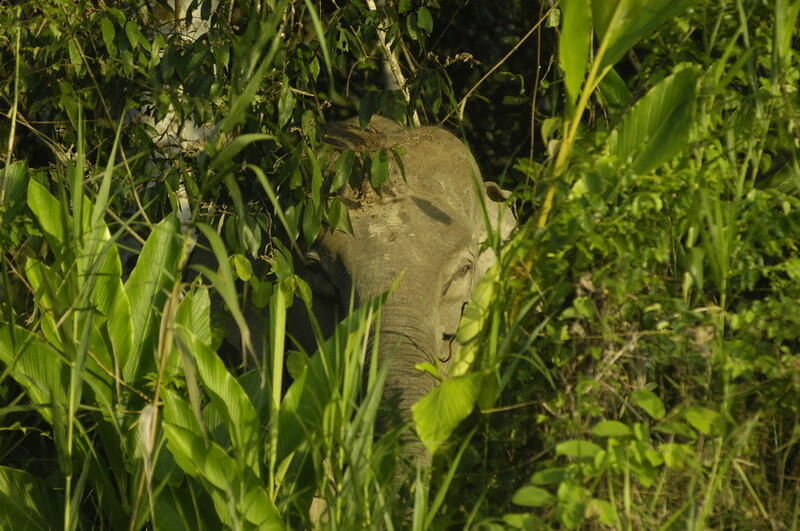 However, in the Lower Kinabatangan, in the state of Sabah, Malaysian Borneo, elephants are hostile towards any man-made objects within the forest. For example, traps set by the local community to catch smaller mammals are located and trampled by elephants and any part of a settlement that encroaches into their forest is in danger of destruction. Elephants are able to swim very well and will cross river barriers in order to move through their home ranges. The Bornean Elephant is the largest of Borneo’s mammals, but when in the forest these elephants are able to move freely without causing damage to trees and smaller vegetation. The Bornean Elephant is found in the Lower Kinabatangan floodplain in the state of Sabah, Malaysian Borneo and, occasionally, in the Indonesian state of East Kalimantan. Generally they are found in lowland forest, which in the Kinabatangan is seasonally inundated with floodwaters. There are an estimated 1,000-1,600 individuals left and the largest population is found in the Lower Kinabatangan floodplain. Unfortunately, the increase in global demand for palm oil has led to increased human-elephant conflict and the elephants are now severely threatened by habitat loss as deforestation for oil palm plantations and logging continues. World Land Trust (WLT) has been supporting conservation measures in Kinabatangan since 2008, in partnership with Hutan and LEAP Spiral, two conservation organisations based in Malaysia. Ongoing protection of forest in the Kinabatangan floodplain is a key conservation measure for the Bornean Elephant.